Natural Steels is a renowned supplier and manufacturer of Buttweld Stub End Fittings in India. 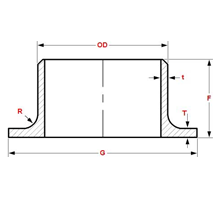 Stub ends are fittings used in place of welded flanges where a rotation back up of flanges is desired. Rotating back up flanges is set up at the back surface of the Stub End. The stub ends are manufactured in various standard dimensions, grades like ASME, ANSI, DIN etc, and forms according to the requirements of our esteemed clients. The Stub Ends are manufactured in all standard dimensions in flanged, Victaulic and threaded ends. ANSI B16.9 Stub End and ASME B16.9 Stub End Fittings are our most high in demand products throughout the year owing to its high resistance to corrosion, surface abrasion and rate of thermal ductility. We at Natural Steels are engaged in crafting these Stub Ends to serve its functionality to its best under the supervision of our diligent and extremely talented professionals. These stub ends are installed in pairs and mated together with two joint flanges. Natural Steels manufactures a wide range of Stub Ends using exotic metals like Stainless Steel Stub End, Brass Stub End, Cupro Nickel Stub End and so on. Find their application in many commercial establishments. These Stub Ends find a great application in the oil and gas industries, petrochemical industries, engineering, chemical, sugar, power generator, and fertilizers industries. Buttweld Stub Ends and other fittings are designed in compliance with the national and international standards and are corrosion resistant, strong and durable. Contact us now for a free quote! Natural Steels is one of the top manufacturers and suppliers of Pipe Fittings from India. Our prices for Stub End Buttweld Fittings are very reasonable. Please click on contact us now button or click here to send your requirement. Natural Steels maintains a high-inventory of Buttweld Fittings and can export them at the best price for Stub End Buttweld Fittings. Natural Steels is a leading manufacturer, supplier, and exporter of Stub End Buttweld Fittings from India. We maintain a huge inventory of Buttweld Fittings and you can buy Stub End Buttweld Fittings at the best price. Please click on Contact us now button or click here to send us your complete requirement to Buy Stub End Buttweld Fittings from Natural Steels. Exporting Stub End Buttweld Fittings to Singapore, Malaysia, Hongkong, Thailand, Indonesia, Taiwan. Other countries includes Afghanistan, Albania, Andorra, Austria, Bahrain, Bangladesh, Bhutan, Brunei, Belarus, Belgium, Bulgaria, Cambodia, China, Cyprus, Croatia, Czech Republic, Denmark, Estonia, Egypt, Finland, France, Germany, Greece, Georgia, Hungary, Iceland, Ireland, Italy, Iran, Iraq, Israel, Japan, Jordan, Kazakhstan, Kuwait, Kyrgyzstan, Lebanon, Latvia, Latin America, Liechtenstein, Lithuania, Luxembourg, Malta, Moldova, Monaco, Maldives, Mongolia, Myanmar (Burma), Nepal, North Korea, Netherlands, Norway, Oman, Poland, Portugal, Pakistan, Palestine, Philippines, Qatar, Russia, Romania, Russia, San Marino, Serbia and Montenegro, Slovakia, Slovenia, Spain, Sweden, Switzerland, Saudi Arabia, South Korea, South Africa, Sri Lanka, Syria, Tanzania, Tajikistan, Thailand, Turkey, Turkmenistan, Ukraine, United Kingdom, United Arab Emirates (UAE), Uzbekistan, Vietnam, Yemen.